mRELEVANCE, LLC is excited to announce it recently won a silver award at The Nationals new home sales and marketing awards competition. The Nationals, presented by the National Association of Home Builders (NAHB) National Sales and Marketing Council (NSMC), honors the best in new homes sales and marketing. mRELEVANCE was recognized for its development of client FrontDoor Communities' new website. With the creation of a new website, mRELEVANCE refreshed the look and feel of FrontDoor Communities' online presence. Its innovative design features a large header with photos; includes a backend admin that allows for information to be easily managed and updated by the builder; and is easy to navigate. The finger-friendly site can be browsed from a desktop, tablet or smartphone and has a prominent contact form to capture leads. It pulls all of the builder's communities into one website, even when a different and separate design and brand for specific communities is necessary. 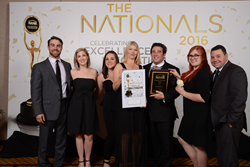 The Nationals Gala is one of the building industry's most prestigious events. Now in its 36th year, The Nationals pays tribute to superior sales and marketing achievements by individual professionals, homebuilders and associates, and sales and marketing councils and salutes their determination, integrity, creativity and endurance. For more details about The Nationals, visit http://www.thenationals.com. For more information about the services offered by mRELEVANCE, visit http://www.marketingrelevance.com.